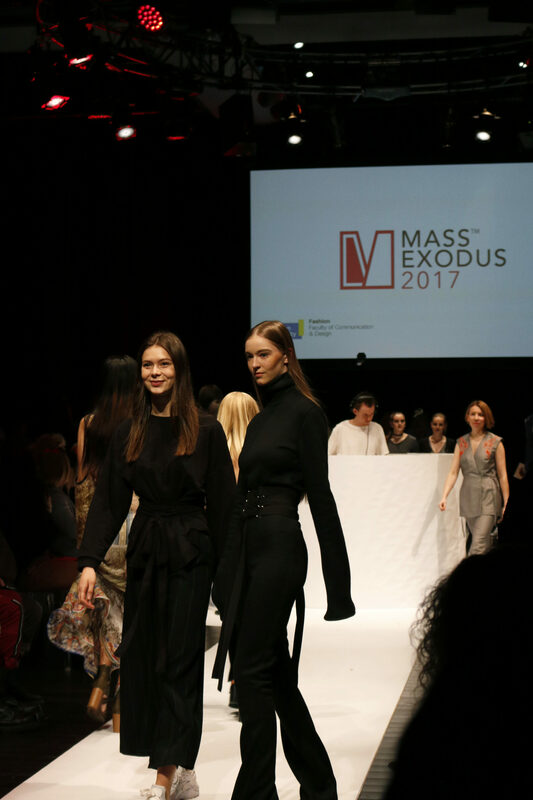 This version includes a photo gallery of Millie Yates’ collection featured at this year’s Mass Exodus. 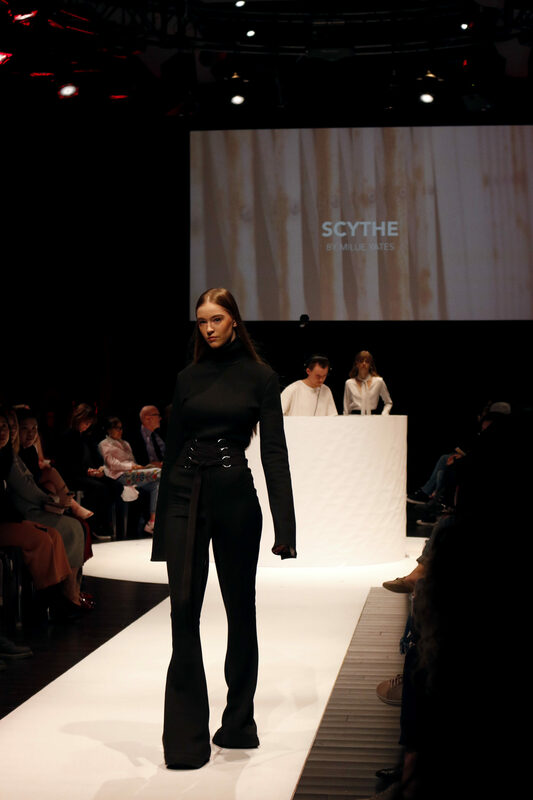 Each year, senior fashion design students are given the opportunity to showcase the fruit of their labour from their final year — a collection created entirely by themselves. Yates is a graduating fourth-year who says that “the pinnacle of the four years is participating in [Mass Exodus]. 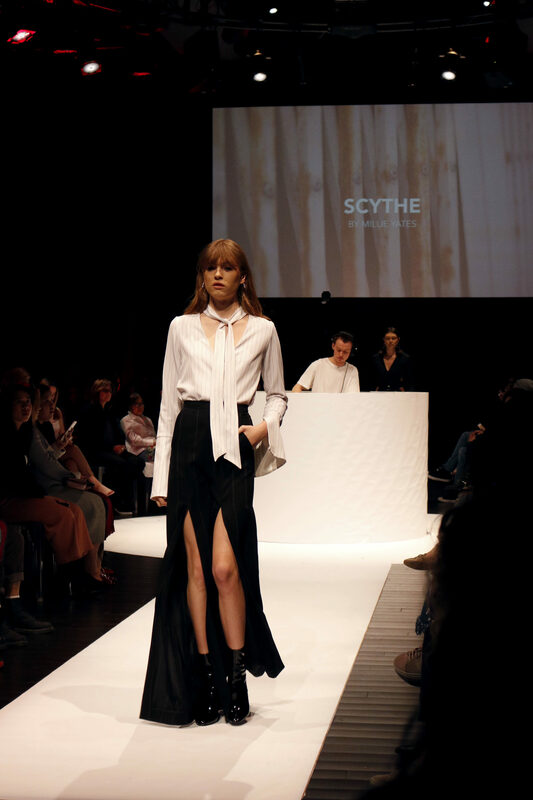 Yates is originally from Peterborough, Ont., where she says a fashion presence is limited. Besides some close friends who were mildly interested in fashion, her pursuit of the career has been mostly independent. Beginning with sewing lessons in Grade 2, Yates’ love for fashion and design continued to grow throughout the years. Four years later, Yates has already secured a job with Abercrombie & Fitch after interning there last summer, with help and guidance from her program. A predominantly black and white collection, Yates uses that as a play on lightness and darkness, aligning with the theme of shadows that runs throughout the poem. She further expands on this motif through pleating and the illusion of depth with slits and long-flowing details. 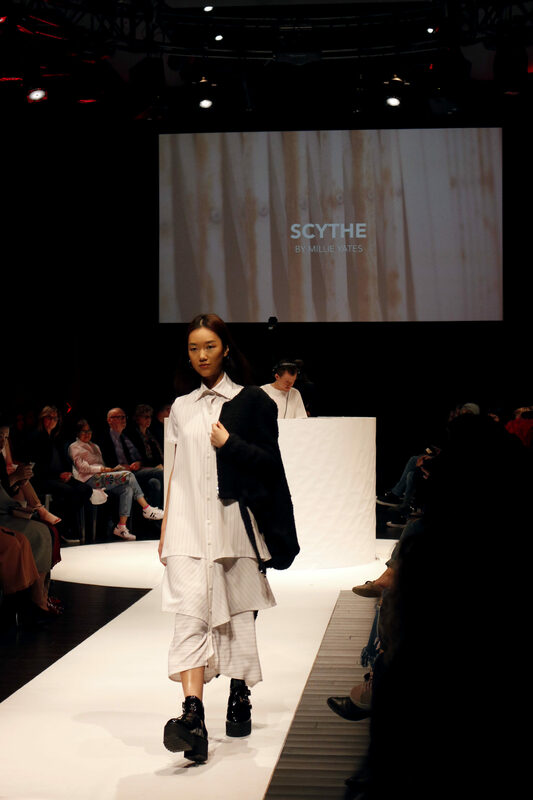 The collection, which consists of eight pieces and five looks, includes co-ordinated separates, with pinstripe being the main pattern of the fabric, in conjunction with various natural textiles, such as cotton, silk and wool. And as for the name? Yates says she liked how the word “scythe” fit in with her theme. As an agricultural tool for reaping crops, she liked the contrast of a soft-sounding word that describes a hard blade. Yates has been working on her collection since last summer, where she was constantly sketching and “getting out all those bad ideas.” However, despite it seeming like these students have an abundance of time to work on their collections, Yates said all the muslins (essentially a prototype) for each piece have to be made and completed within a one-week span during their fall term. 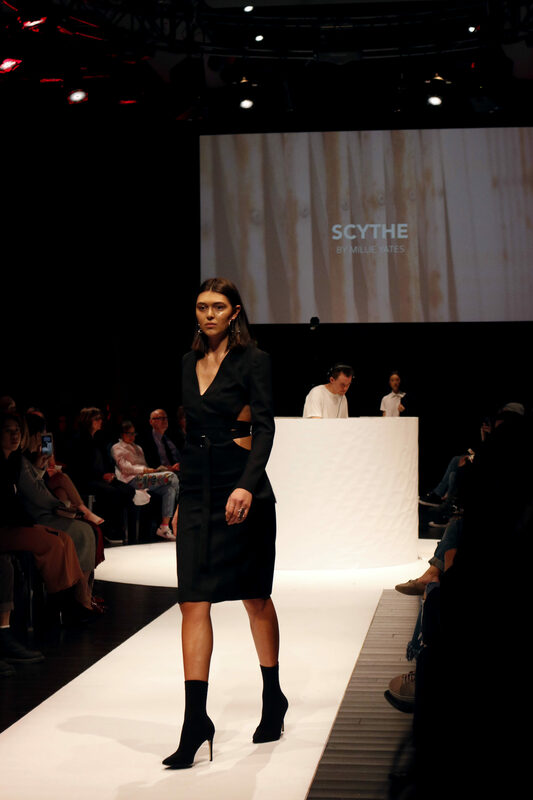 Time constraints such as these give just a small taste of the pressures fourth-year fashion design students face, especially given the fact that Yates says she typically spent a total of about 30 hours on each individual garment. 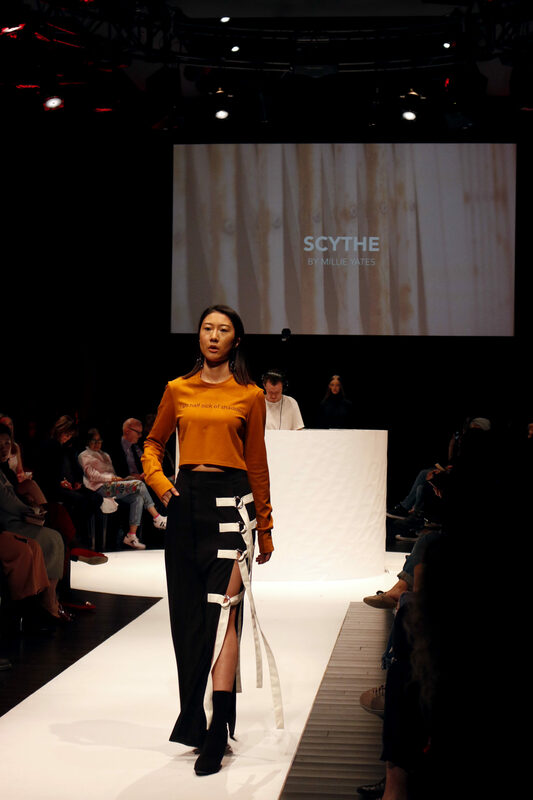 With so much effort put into this collection, Yates hopes that she’ll be able to sell some of her pieces to be worn in editorial work, although she does not plan on showing the collection in another show or mass producing her products. Her reason behind it is simple: fashion is tricky, and trends fade.